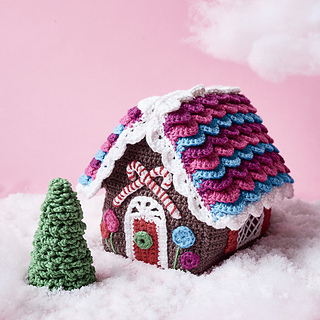 Want a non-fattening gingerbread house? Here is just the thing. This is a fun Christmas decoration that will last for years and possibly even become a family heirloom! It is made of a cotton blend yarn using 7 colours and filled with fibre fill. To ensure a flat base, a cardboard or plastic rectangle is inserted before adding the fibre fill. If you use plastic, the house becomes washable. The roof is made using the crocodile stitch to form the tiles. Make just one, or as many trees as you like in different sizes to make a wonderland setting for your house. Make it for yourself or as a gift - either way, it is a fun project.